Can you spot the B2B sales elephant in this blog? Imagine if you had an email address from a prospect who’d just downloaded a special report on your website. As a B2B sales professional what do you do next? You’d want to qualify it. The subject matter of the special report. How is that subject matter important to the prospect? How is that special report guiding the prospect to one of your solutions? Most people are looking for answers to challenges they are trying to transform. This prospect at least has indicated a general interest in a solution. The time the report was downloaded. You know when the special report was downloaded. They are actively looking for a solution now. The email address The email may contain a domain name related to a company. Exclude personal email addresses like Gmail, Hotmail etc. It may even contain the name of the individual. Is this enough to qualify the lead and properly follow up? A good B2B sales person is not going to sit on their hands. Act quickly, otherwise the prospect is likely to say yes to the first vendor they find that meets their general requirements. An email follow up with 5 minutes at least drops into the prospect’s inbox. How is it bad? Acting quickly isn’t bad, but acting in haste is. You want to make that good first impression. 63% of prospects requesting information today will not purchase for at least 3 months and 20% will take more than 12 months to buy. [Source: Marketing Donut]. Your initial email is your “first 10 seconds” moment that can impact the longer-term chances of your business being considered the front runner to solve that person’s problem. Research by the University of Toledo into interviewing, suggests the first 10 seconds in an interview can make or break you. The CV, or let’s say your lead magnet got you the interview, then the interviewer – your prospect – rapidly sizes you up and has probably decided whether you’re going to get the job. The parallels for B2B sales are scarily apparent. You respond quickly to the lead and in so doing put at risk the whole sale. Plan a friendly and confident contact. Make your initial contact all about the prospect. You know they may be interested in the subject area, so thank them for their interest in your information and ask them what their special interest was. But, you just know you’d like to know more about them before you launch straight in. Make the most of your first words. Emails can often be read wrongly, you can be too formal or too casual for your prospect. Is your current approach to simply spill out a lot of words about your company? Shouldn’t it be ALL about them? You are in the attraction process right now. How will you put the prospect at ease, yet motivate them to get to know more about you? Would your chances of success improve if you could get them on the telephone? Look the part. In an interview, you’d dress according to the company. Is it casual or formal? Yes, you have your own B2B sales organisational style, but just because you rock the jeans look in the office, doesn’t give a pass to turn up at their offices like that, does it? Imagine if you knew the market sector they are from, the size of their organisation, where they were based, the number of employees, even the technology they used, would it help you ‘turn up’ appropriately? ‘Click’ with the prospect. If you click with the interviewer, you’ll have a far higher chance of getting the job. People will hire you if they like you and are a good fit for the company. Reckon it’s any different in B2B sales? Are you that good in emails that you click every time? No, nor am I. You’ll have a better chance of clicking if you can get some feedback from the prospect. That could take several emails or far better a telephone call. Act quickly. Be friendly and confident. Make your first words all about the prospect. Be like them. Get feedback. The risks you face by ignoring the rules and NOT having enough information about the prospect will be fatal to your chances of success. Relying on one channel of communication seems a pretty limiting B2B sales approach. If your team is not brilliant at following up these leads via email, then you’d be guilty of leaving money on the table. Negative impressions are formed very quickly. Did you spot the elephant(s) in the blog? An email is NOT enough. Given there is just an email address, the four approaches are all screaming out for more information, fast. It is going to be difficult to ‘start a conversation’ with the prospect just by email. Additional sales force costs. If there is one email, you can start searching the internet to capture more information to go on. This is the trap many sales people fall into. They trawl the internet for random pieces of information and then populate their CRMs accordingly.A practised sales individual may be able to get a detailed search done in 8 minutes. Let’s say your B2B sales and marketing guy is costing £22,000 per year in salary and another £10,000 in other costs. They work 220 days per year. That’s £19.40 per hour. In other words, the lead has just cost you an additional £2.75, before it is even contacted. 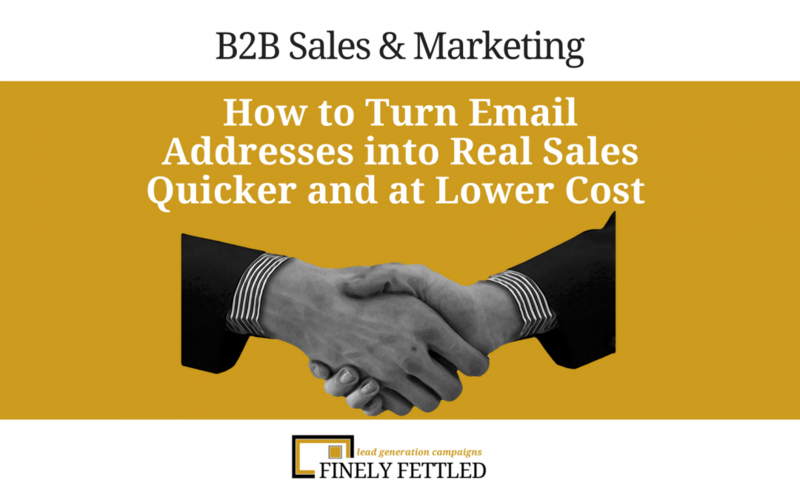 It has already cost your marketing budget to generate the email address. What if there is far more than just one email address? Your team’s time to react starts to slip. Corners get cut. Search times shorten. Researched data quality is poorer. The leads represent your business’s future. They are important, way too important to handle badly. So, you need a solution that will get you into that pole position, fast. Click here for an idea which could make your year. And be sure to secure your own special offer for doing so.